(El Segundo, CA) On March 21st, the LAEDC hosted our latest R.E.D Talk, at Cross Campus El Segundo. How does automation affect jobs? How can we prepare students for an unpredictable future? Here are the latest innovations and insights on a rapidly evolving technology straight from industry experts. 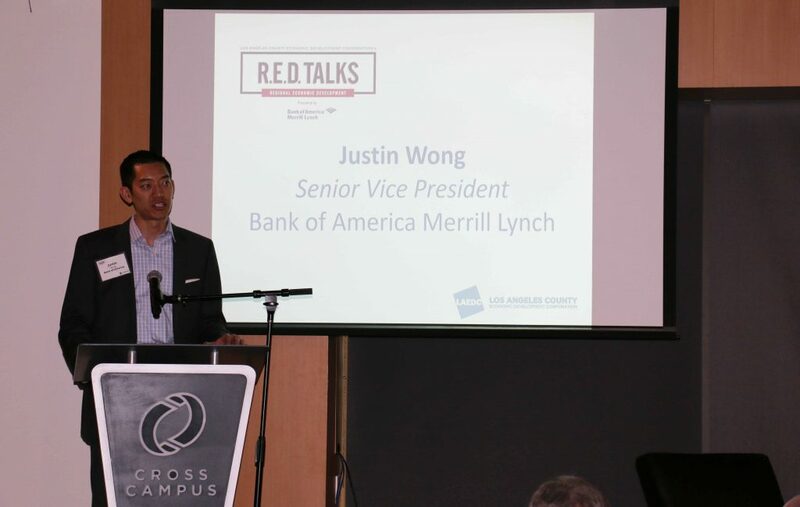 As the Senior Vice President, Market Executive for Commercial Banking for the South Bay, Justin Wong’s continued presence at R.E.D Talks signifies a lot. The commitment of Bank of America Merril Lynch to include top leadership like Mr. Wong in these events helps the LAEDC create a platform for meaningful conversation that includes a full spectrum of voices. 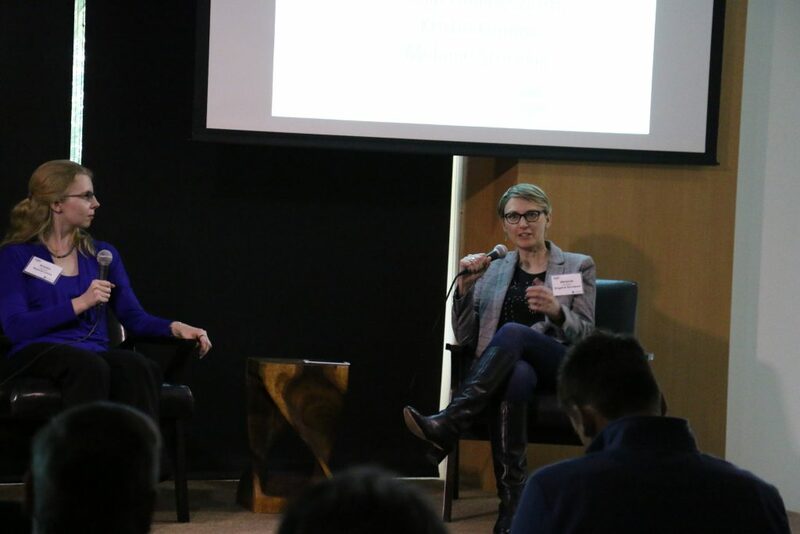 A vibrant room filled with leaders from business, academia, government, and advanced technology helped this and every Regional Economic Discussion to truly be a platform for tangible change — Bank of America Merril Lynch is vital to this vision. 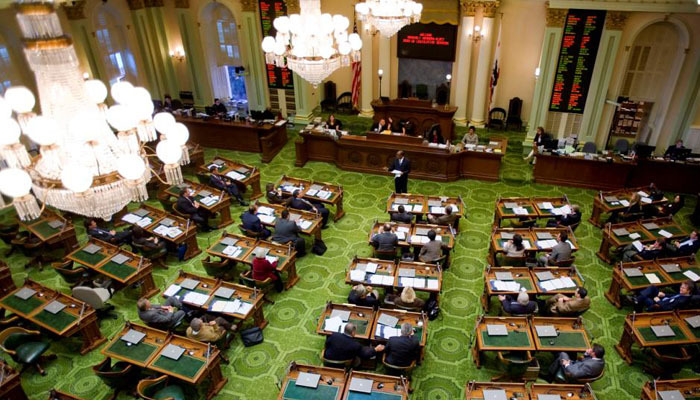 As one of the largest commercial banking groups in the U.S., B of A/ML has long been a supporting partner of the LAEDC, our city, and the state of California. To date, they have provided $4.4 billion in loans to small businesses in California, and In L.A. County over the past five years they have contributed an additional $30 million to philanthropic partnerships as well as nearly 300,000 hours of volunteer hours contributed locally. Special thanks to Bank of America Merrill Lynch, for their unwavering philanthropy and support for L.A. County, as well as their continued vested interest in supporting regional dialogue which pushes the boundaries of what is possible for local industry and business moving forward. What are the three D’s and how can A.I. work for you? Rob Vikcery, Co-Founder and General Partner of Stage Venture Partners, helped to set the tone with a comprehensive overview of investing in artificial intelligence, something Stage VP and Mr. Vickery are very familiar with. Since its inception in 2015, Stage VP has leveraged the diverse backgrounds of its founding partners, to identify cutting-edge software technology for enterprise clients. 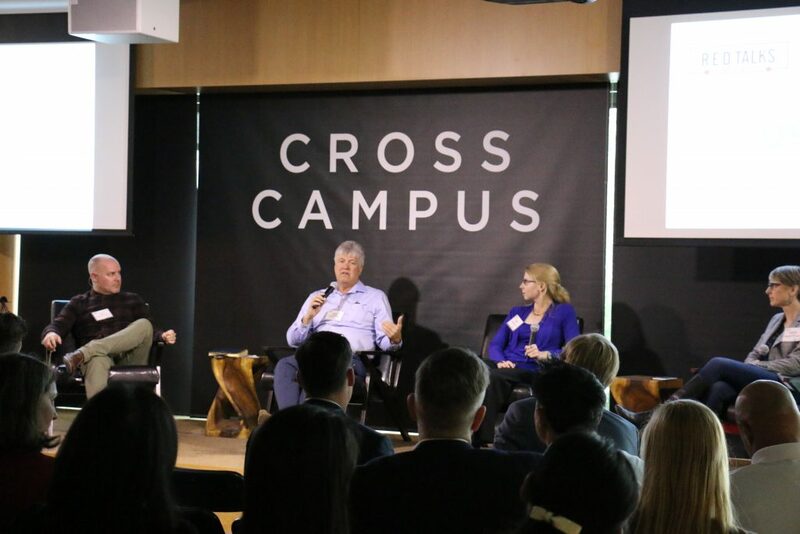 Of the 23 enterprise software companies, includes companies like Elementary Robotics, Kuona, Slingshot Aerospace (who also spoke during the event) and Balto which Stage VP believes are just a few of the companies capable of solving some of our nation’s most complex problems. 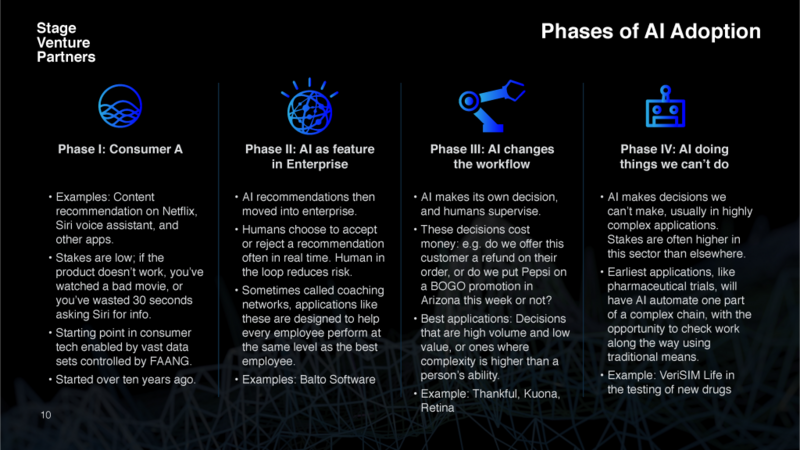 The Phases of A.I Adoption via Rob Vickery of Stage VP, who says we’re currently somewhere in “Phase Two” of this model. Mr. Vickery not only provided a historical overview of A.I., it phases and where the industry seems to be headed but also provided the blueprint for business to searching for a pathway to adding advanced technology solutions to their business. Rather than rewriting your entire business model to fit A.I., Vickery encouraged those in attendance to put A.I to work for you instead of the other way around. “Focus on your verticals and allow artificial intelligence to handle on your dull, dirty, and dangerous tasks,” said Vickery. Phillip Hollingsworth, Senior Technical Engineer, Universal Robots Inc. addresses the audience at R.E.D Talk. According to many of the event’s featured industry experts, robotics is opening new pathways for innovation and ultimately revenue. “Robotics helps encourage growth with many of the clients we work with,” said Phillip Hollingsworth, Senior Technical Engineer with Universal Robots Inc., a Danish Manufacturer with offices in Irvine, California which has sold more than 31,000 collaborative robots used daily around the world. “Our goal is to utilize our robotic capabilities to allow businesses to create more jobs and increased bandwidth for senior leadership to manage higher-level aspects of their business,” said Hollingsworth. What are some of the latest innovations in A.I? Melanie Strickland, Co-Founder and Chief Strategy Officer, Slingshot Aerospace Inc. discusses some of the latest innovations in risk mitigation and situational intelligence. El Segundo based, Slingshot Aerospace is working with industry data providers and aerospace system integrators to develop specific, repeatable solutions to geospatial information challenges in industries like insurance and defense. Melanie Strickland, Co-Founder and Chief Strategy Officer, is responsible for the technical vision and strategy of the company to revolutionize data exploitation for defense and commercial applications. She possesses a unique blend of leadership and technical expertise in combat operations and innovative space system development garnered from her time in the Department of Defense and was able to help paint a clearer picture of some of the most cutting-edge technology. For example, their platform connects to data streams from satellites, aerial vehicles, and ancillary data sources. This process allows their machine learning and computer vision algorithms outperform any analyst while providing a stream of usable data and information. Learn more about their incredible capabilities at slingshotaerospace.com. The Full A.I. Answer? An exciting story that is still being written..
Kristen Lennox, Technical Head of Industrial IoT, Beyond Limits, discusses A.I. during a panel discussion at R.E.D Talk. 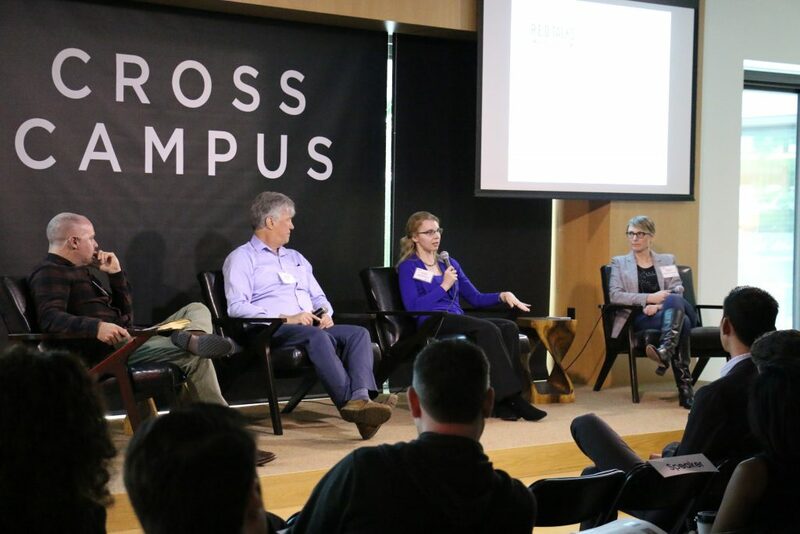 While there is still a ways to go to realize the full potential of robotics, artificial intelligence, automation and how they all can work in symphony, the overarching theme is one of excitement for Kristen and her team. Thank you for your commitment to support the Los Angeles aerospace industry.